Welcome to Must Read, where we single out the best stories from around the automotive universe and beyond. Today we have reports from Green Car Reports, Motorsport, CNN, and New York Observer. A predictably smart piece from our predictably smart friend John Voelcker. 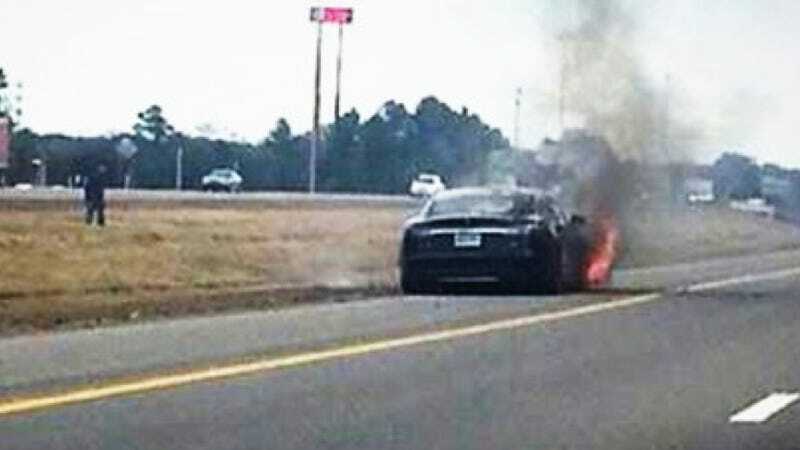 There have now been three separate fires among roughly 20,000 Tesla Model S electric luxury sedans on the world's highways. The most recent one, two days ago, seems to have set off a fresh round of Internet fulmination—combined with much opining on what the news would do to the falling stock price of Tesla Motors. So let's pull together all the facts, and sort out what we know from what we still need to find out. A great inside look at one of the great F1 drivers of this generation. There's no fanfare when Sebastian Vettel turns up for a press conference to celebrate his fourth world title: he's slightly late, because fog delayed his touchdown at Cranfield, but slips in almost unnoticed wearing Red Bull jacket and jeans. Our own Aaron Foley is on CNN. Check it out. Friend of Jalopnik Neal Pollack won big on Jeopardy! Here's how. I was on Jeopardy!, and I was going to lose. Not only that, but it looked like I was going to lose epically, disastrously, as bad as Wolf Blitzer had, but even worse, because I wasn't playing for charity. This had the potential to be one of the worst Jeopardy! performances of all time.